Adding a bit of cheer to the gray cubicle. I decided to branch out and try another brand. This time I chose snackTAXI, because their designs are so cute! 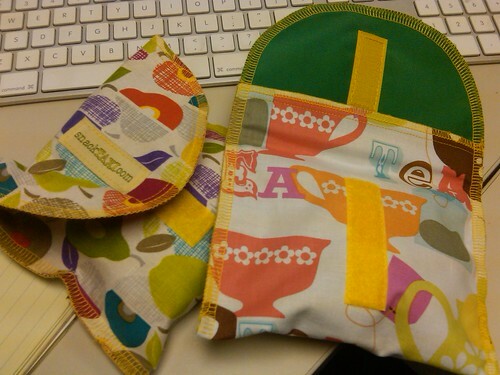 My PB Green Bags have Velcro all the way across the top, whereas the snackTaxi ones have a little Velcro tab. Since each brand seems to be based out of a different family’s home, there are lots of interesting variations– but they all seem to work well. But seriously, my inner child and my outer adult feel good about my one-woman attempt to not fill landfills with my Ziploc usage. Yay for environmental consciousness! So cute, too!